The Taccia Dual-pen Leather Pouch is made from genuine leather. Designed to fit all standard size pens and can easily fit your purse or jacket pocket. Choose from a variety of bright vibrant colors. The perfect accent to any writing instrument. A great way to protect and carry your pens. The Taccia Dual-pen Leather Pouch Pen Carrying Cases usually ships within 1 business day unless otherwise specified. Each Taccia Dual-pen Leather Pouch Pen Carrying Cases we sell is guaranteed to be genuine, authentic and will arrive brand new & unused! This is a nice leather pouch with a good price. You can't go wrong with this product. I can fit a 3rd pen with ease between the 2 slots. It fits nicely in a shirt pocket without a bulky feeling. I recommend this product. The two pen carrying case is great. Holds most pens nicely. It is a little tight for larger pens like the Jinhao 159. It's a bit snug for that size pen but I worked one of the sleeves for a while to accommodate the larger pen and since it's an all leather carrying case it does give a bit so if you really wanted to you can fit a larger diameter pen in the pen sleeves. It's leather, it has a very nice zipper that works smoothly. I think it's a great value and I use it every day. This review is for Taccia dual-pen brown leather pouch pen carrying case: This is a well made case for pens and the construction material is substantial and feels nice to touch. The zipper works smoothly and the case keeps the pen dust-free. The size of the case is comfortable in my hand. It can hold up to 6" long pens, and the pen-holding loops are stitched in such a way that two pens can be positioned well separated. Against advise, I can perhaps keep one more pen in the free space outside the loops between the two pens, if needed. Not bad. Made in China. Carries my two favorite pens.Like the looks and functionality. Highly recommended. Love this and very reasonable price. This is a very nice little pouch. Holds the two pens I use most without being heavy or cumbersome. Supple leather, and elegant. Quality products and service at a great price! Can you tell me the interior dimensions? 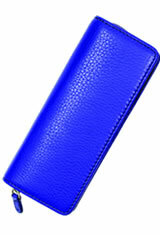 The Taccia leather case measures 6" long by 2" wide inside the zipper. The leather loops will hold a pen that is up to about 0.625 inches in diameter although the leather is soft and can stretch slightly. Will it fit fountain pens like Monteverde Regatta Sport fountain pen or Lamy Al-Star Fountain? Yes, the Taccia dual leather pen pouch can fit just about any fountain pen. This is the Taccia dual pen leather carrying pouch. It is made from all real leather. You can see the nice pebble texture throughout with nice stitching around the edges and a zipper closure to keep the pen case closed. It has a chrome zipper with a nice leather tab. It makes it easy to open and close the case. The interior of the case is also made of real leather with the Taccia logo imprinted on the inside. On the opposite side we have two compartments for holding two different pens which keeps the pens in place and from damaging one another. This is a great carrying case for your pen. It is high quality and made from real leather. Get your Taccia dual pen leather carrying case at PenChalet.com!